Many companies on the internet claim to want to help you make money online, when in fact they use you to help them make money more than anything else. Such companies will tell you if you pay their high membership fees that everything they have is yours free. However, once you get in, you find out that they will charge you for everything they can, just to get more money. 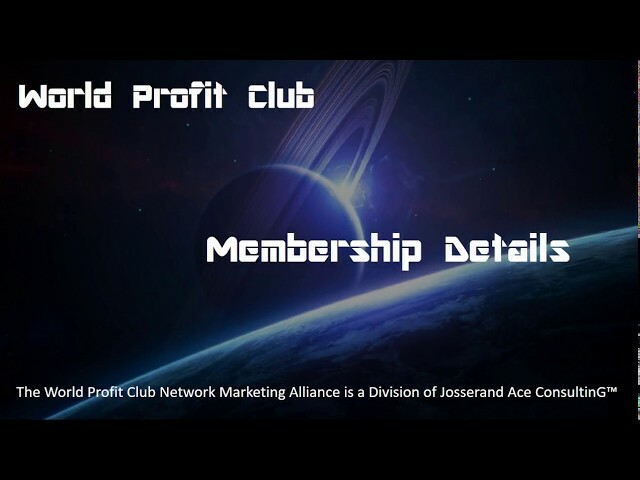 JacG’s World Profit Club Alliance was created to solve that problem. We have no problem with other companies making money, but disagree with it being at the expense of their members. When you join us, depending on your membership level, you get everything that comes with that level at no additional charge over the cost of your membership! …PLUS… you get anything we add to your level as time goes on (and we’re adding things all the time) ALSO at no addtional charge! This is how it’s supposed to be. Come join us and let us prove it! All memberships below are paid memberships, and receive varying amounts of free products and services in addition to free training. For instance, all below receive a free lead capture website, with (potentially free) domain name, free list and email management services, free hosting, free PLR products for resale, and that’s not all. Why Become A Member of WPC? We offer things no other network marketing company offers like 25% commissions for free members, access to better healthcare at lower cost, and lots more. Details in the video and at our sites.